This year’s fierce election battle prompted me to pick up this 2014 book, by an Oxford University scholar who has studied political leadership—good, bad, and ugly—for more than 50 years. Brown shows that the leaders who make the biggest contributions to history and humanity generally are not the ones we perceive to be “strong leaders.” Instead, they tend to be the ones who collaborate, delegate, and negotiate—and recognize that no one person can or should have all the answers. Brown could not have predicted how resonant his book would become in 2016. All too frequently, leadership is reduced to a simple dichotomy: the strong versus the weak. Yet, there are myriad ways to exercise effective political leadership-as well as different ways to fail. We blame our leaders for economic downfalls and praise them for vital social reforms, but rarely do we question what makes some leaders successful while others falter. 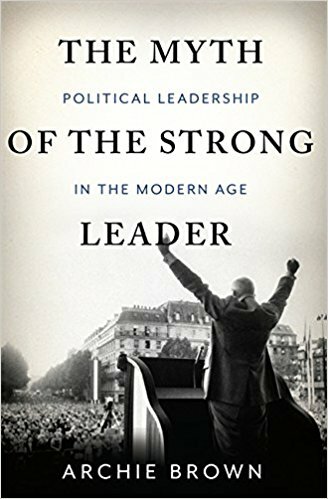 In this magisterial and wide-ranging survey of political leadership over the past hundred years, renowned Oxford politics professor Archie Brown challenges the widespread belief that strong leaders - meaning those who dominate their colleagues and the policy-making process - are the most successful and admirable. In reality, only a minority of political leaders will truly make a lasting difference. Though we tend to dismiss more collegial styles of leadership as weak, it is often the most cooperative leaders who have the greatest impact. Drawing on extensive research and decades of political analysis and experience, Brown illuminates the achievements, failures and foibles of a broad array of twentieth century politicians. Whether speaking of redefining leaders like Franklin Delano Roosevelt, Lyndon Johnson, and Margaret Thatcher, who expanded the limits of what was politically possible during their time in power, or the even rarer transformational leaders who played a decisive role in bringing about systemic change - Charles de Gaulle, Mikhail Gorbachev and Nelson Mandela, among them - Brown challenges our commonly held beliefs about political efficacy and strength. Overturning many of our assumptions about the twentieth century's most important figures, Brown's conclusions are both original and enlightening. The Myth of the Strong Leader compels us to reassess the leaders who have shaped our world - and to reconsider how we should choose and evaluate those who will lead us into the future.